Any aspiring welder or construction worker seeking a great place to get started would do well to consider Texas. The Lone Star State offers many attractions for skilled laborers and skilled laborers-to-be, from promising chances of employment and strong starting salaries/wages to opportunities for comprehensive career training in specialized fields. True to its time-honored reputation, Texas is very much an oil and gas center—and this industry depends heavily on skilled construction and welding personnel. Business is booming, particularly in the oil, gas and shale industry out near the Gulf Coast, where Bloomberg reports that local companies will need to fill close to 36,000 construction openings by 2016 just to take advantage of the resources there. Building and manufacturing are also evergreen industries in Texas, with its healthy real estate market and numerous high-tech centers. Oddly enough, however, these industries are also hurting—because they can’t find enough skilled laborers to keep up with demand. According to the Statesman, thousands of these jobs are currently going unfilled due to a huge shortage in qualified, properly trained personnel to replace outgoing senior workers. This means that a new influx of trained welders and construction workers may almost certainly enjoy plentiful job and career options in Texas. As one might expect from the many options and opportunities noted above, Texas might serve as a sensible place to make a good living as a welder. This applies not only to job openings but also to salaries. While earning power varies from city to city as well as skill and experience levels, Salary.com cites no fewer than 12 major population centers where someone in a Welder 1 position can expect to exceed the U.S. median income for that position. These lucrative locations include Carrolton, Dallas, Frisco, Garland, Grand Prairie, Houston, Irving, McKinney, Mesquite, Pasadena, Plano, and Richardson. With all the job opportunities and the favorable earning environment, it’s no surprise that training schools would want to set up shop in the Lone Star State to accommodate the many prospective students who need education and welding training in their respective fields. This convenience makes it easy for anyone interested in these lines of work to get the essential knowledge and skills they need to compete in the Texas marketplace and fill some of those in-demand spots. Texas training schools are established institutions with different types of welding programs. For instance, we have recently opened Tulsa Welding School & Technology Center in Houston. This campus in Texas provides welding certification classes and Welding Specialist with Pipefitter programs, with classes scheduled Monday through Friday. Enrolling at our Houston campus is a great way to get started moving towards a successful career. 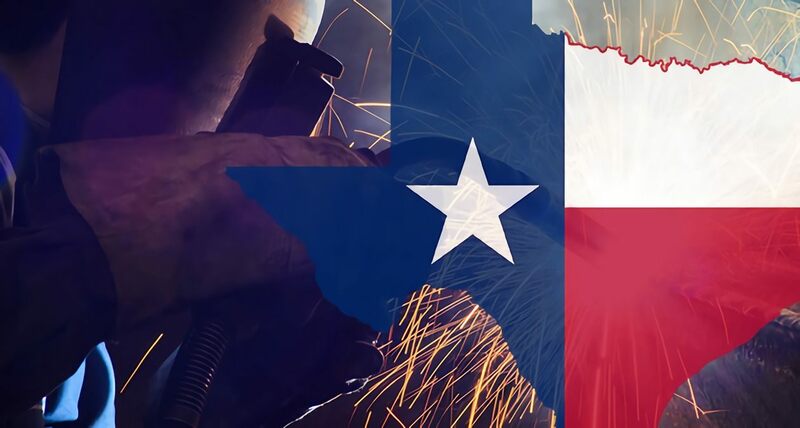 In short, Texas is a hotbed for both career options and training/education options, making it an incredible “one-stop shop” for anybody who wants to get a welding or construction career up and running as quickly and profitably as possible. Many of tomorrow’s skilled tradespeople will be glad they began their new lease on life in the Lone Star State.